The door opener at the front of the bus has been removed for more clearance in loading and unloading. The ceiling panels have been removed for cleaning and waxing, and the lower wall panels have been stripped of their carpet. The new carpet for the bus is in a roll on the floor. The insulation in the walls has been exposed and is in good shape. The propane heater is at work warming the work area. The carpet is a commercial grade tight weave berber. It should last for a pretty good while. 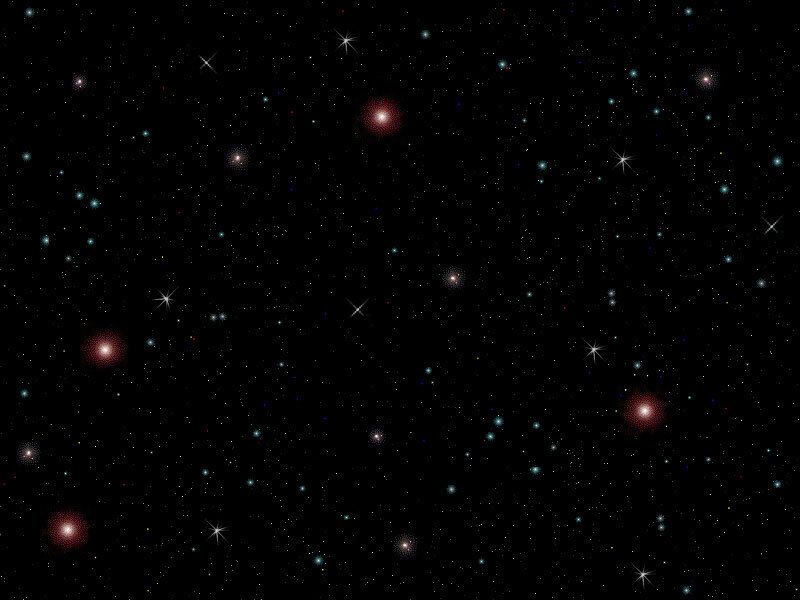 The small black foam blocks on the ceiling have been added to reduce noise of the ceiling panel hitting the crossmembers when the bus hits a bump. 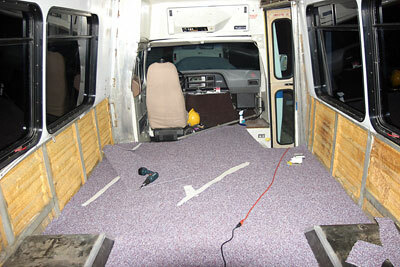 Here is the bus with the floor carpeting installed. 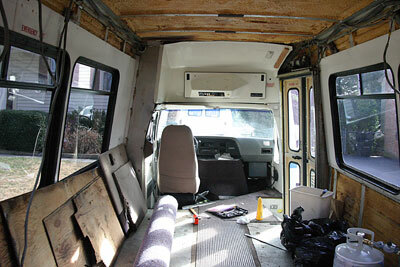 The three ceiling panels have been waxed and reinstalled using new fasteners. 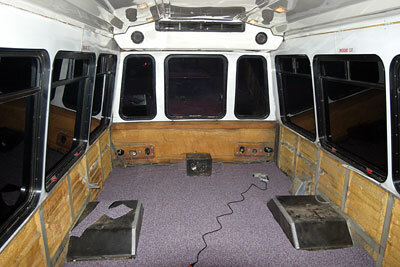 The bus has plenty of room when it is empty Looking toward the front of the bus, the carpet has been rough trimmed to make work on the positioning of the carpet an easier task. The carpet must now sit for a few days, at least, to allow it to settle and expand for final trimming. 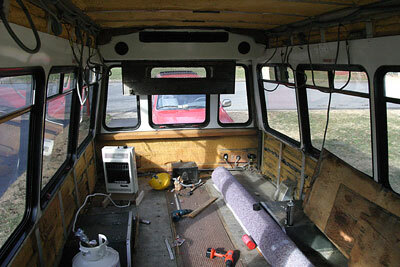 Here you can see the desk has been framed in at the back of the bus. It will be here that telescope controls will be operated. 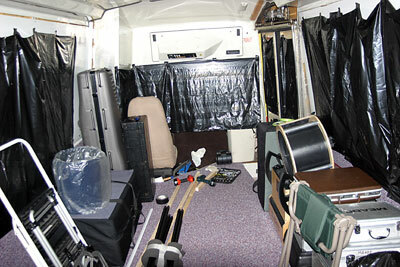 All the equipment is in the bus, but the cabinets are yet to be built and installed. 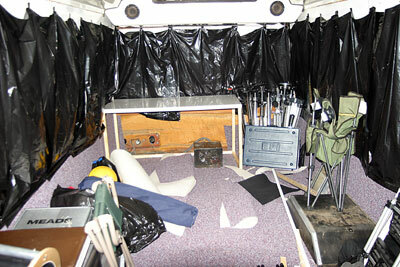 The trashbag curtains keep prying eyes from seeing inside the bus. Looking towards the front of the bus. More trashbag curtains are evident. This bus will hold all the scopes, plus allow living areas, and room to allow outreach participants room to move easily inside the bus.